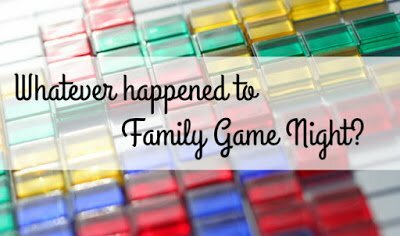 You are here: Home / Fun / What happened to Family Game Night? 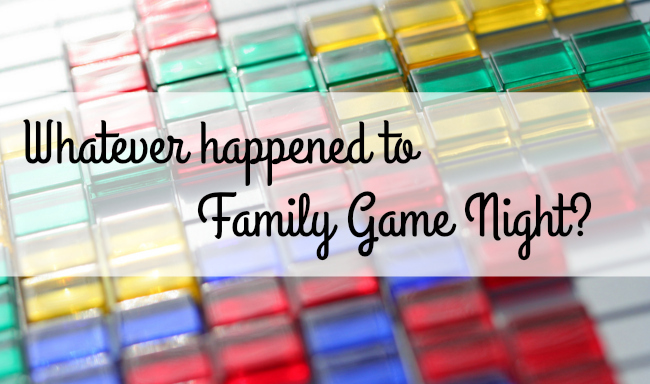 Do you have family games night? Do you just spontaneously break out the games sometimes, or do you have a set night where everyone comes together to play board games? For me I’ve always thought this was a silly question. While we don’t have any one night set aside as “Family Game Time”, we play games with the kids regularly. We are a family of gamers. My husband has over 1200 board games in his collection, yes seriously. We play board games a couple times a week, minimum. We have friends over at least once a week to play games, and we also help host a few different local public board gaming events each month. So when people ask if we do family games night my instinctive reaction is to stifle a laugh. Family games night? Ha. No, we just game All Of The Time. Except lately I’ve found that we don’t. This week I realized I couldn’t remember the last time I sat down and played a game with the girls. I’ve played board games with our Monday night gaming group. I’ve played board games with other grown-ups at the friendly local game store. I’ve played a few two player games with my husband. But when was the last time I played a board game with my daughters? Better yet, when was the last time we sat down as a family and played together, all four of us? Looking back I honestly couldn’t remember. The best answer I could come up with is probably some time in the summer. When it comes to gaming with other adults, we have a schedule and commitments. Every Monday we have friends over to game. Some weeks get cancelled because my husband has to work overtime, or someone in our household is sick, but for the most part every Monday we game. We’ve made it a priority, so it happens. However when it comes to family game time up until now we’ve left it to whim. If one of us happens to feel like playing a board game, and the rest of the family happens to not be busy doing whatever, we might all sit down together and game. Given that we haven’t played anything in over two months I think I can safely say this is no longer working. With both kids in school now things are different. Life is more structured, there’s less downtime. Depending on how strict I am with bedtime the girls are home from school for only three or four hours before it’s time to sleep. A chunk of that time is taken up with homework, and dinner time, and a lengthy getting ready for bedtime routine. Plus one night a week Rainbow has banjo club, another night both girls have Scouts, one night we get together with their grandparents, and another night we might head out to a public gaming event sans kids. If we can fit in journal writing and banjo practicing and scouts meetings and dinner with the in-laws, I’m pretty sure we can fit a board game or two in there somewhere. But we haven’t been making it a priority. Gaming as a family is something that has fallen to the wayside, and realizing that makes me feel melancholy. So maybe we do need to have family games night. Maybe we need to make say every Friday be the night we get together at the dining room table and play games. And if we, as a family of board game crazy folks, need to make a special space for family games night, well then what does that say about your average Joe? What about you folks? Do you play board games with your kids? 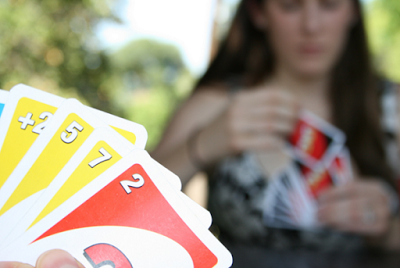 Do you have a regularly scheduled time for family games? or do you just tend to play on a whim? What works for you? Photo credit: First image by John Morgan, Second image by Alexandra M.
The giveaway for this post has closed, Karine G. of L’Orignal ON was the lucky winner of the Mattel Games Night Prize Pack.